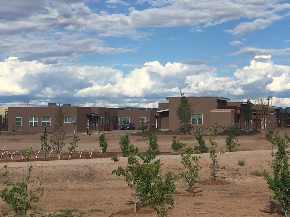 2015 THE Academy graduate Santo Domingo Tribal Housing Authority broke ground on its 41-unit housing project in spring, 2016. RCAC and Native Capital Access (NCA) launched Tribal Housing Excellence Academy (THE Academy), a three year initiative to apply best practices in leveraging resources historically underutilized by Tribes and Native communities to increase the number and type of housing units produced on Native lands. The second cohort graduated in July. THE Academy brings together eight to 10 Native American Housing Assistance and Self Determination Act (NAHASDA) grantees, such as Tribal/Tribally-Designated Housing Entity (TDHEs), Housing Authorities, Tribal/village housing departments and the Department of Hawaiian Home Lands to learn and apply best practices for developing housing on Native land. The selected organizations will each send two staff people to five intensive week-long trainings held over 18 months. The training topics presented parallel stages of housing development. To maximize the capacity building aspect of the training program, participants work on their pre-identified housing project while they attend THE Academy, giving them real world knowledge of the development process. In addition, each organization will receive individualized technical assistance and coaching for up to 30 months from RCAC, NCA and consultants, all of whom are experienced in housing development and finance, and organi­zational management. Eligibility is restricted to organizations that build housing on Native lands within Arizona, Alaska, California, Colorado, Hawaii, Idaho, Minnesota, Montana, Nevada, New Mexico, North Dakota, Oregon, South Dakota, Utah, Washington, Wisconsin and Wyoming. THE Academy was designed to provide an incubator for developing new skills, and forming new strategies for developing and financing housing. THE Academy also gives participants a forum to discuss issues of governance, culture and public policy unique to Tribes. “THE Academy has assisted the Craig Tribal Housing Department tremendously,” Kari Mackie, Craig’s Housing Coordinator, told her fellow THE Academy participants at the graduation ceremony in July. Mackie explained that it’s challenging to build in Alaska, where materials are hard to get and building in a cold climate isn’t very easy. THE Academy helped her and the Tribe with market analysis, appraisals, procurement, funding sources and phases of construction. The Santo Domingo Tribal Housing Authority, who were part of the first Academy cohort, credits the initiative with spurring it to investigate and then apply for Low Income Housing Tax Credits. This led to the Wa-Di project, completed in August 2017, and is an outstanding example of financial leveraging that THE Academy promotes. “The Housing Excellency Academy (T.H.E. Academy) has greatly benefited the Santo Domingo Tribal Housing Authority (SDTHA) through onsite/in-class training’s with direct examples of the do’s and don’ts of Tribal housing development. The SDTHA has used these examples, adapting them to fit our new 41 unit affordable housing development. We’d like to thank T.H.E. Academy for the trainings and support offered through this opportunity”. – Joseph Kunkel, project manager, SDTHA, New Mexico. Prior to 1996, housing development in Tribal communities was driven by programs conceived, administered and funded by HUD. The Native Housing Assistance and Self-Determination Act (NAHASDA) of 1996 significantly changed the model, moving all HUD funding for Tribes into a block grant program that allows them to structure their own approaches to developing housing for their members. 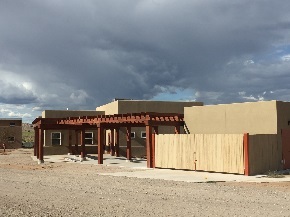 While a welcome change, Tribes continue to struggle to meet the housing needs of all their members, for very low-income families, as well as workforce housing for teachers, health care workers, and public safety officers. Then as now, HUD funds are inadequate. In addition, Tribes have historically faced unique challenges in building on trust land, encountered difficulties in attracting outside, private financing to their developments, and continue to face internal issues around capacity and attracting experienced staff. The first offering of THE Academy was generously supported by a HUD Rural Capacity Building Grant, USDA Rural Community Development Initiative, American Express, Bank of America, NeighborWorks America, Rabobank and Wells Fargo NEXT Awards for Opportunity Finance. The 2017 class is again supported by a HUD Rural Capacity Building Grant. Additional funds are still needed. Please contact Eileen Piekarz, rural development specialist, via email at epiekarz@rcac.org or call (775) 323-8882 for more information, or complete our Request for Assistance.